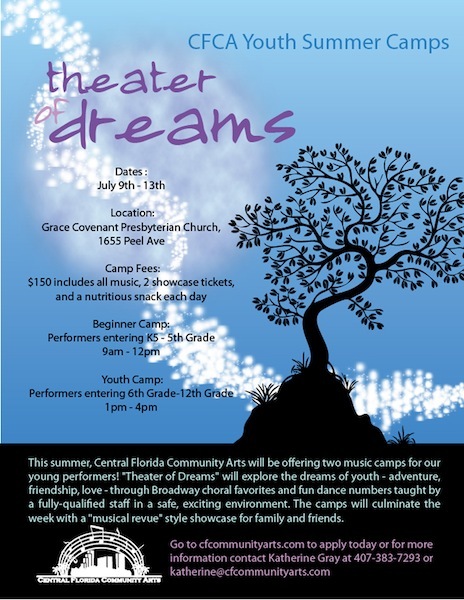 Central Florida Community Arts offers two music camps for our young performers! The Children and Youth Arts Summer Program is designed to use the Arts to develop our younger performers’ creativity, teamwork, and self-confidence while incorporating aspects of theater and dance. A professional staff of musical directors and choreographers also lead workshops to teach auditioning skills and performance techniques. The camps culminates with a “musical revue” style Showcase for family and friends! Mission Statement: The CFCA Summer Camps, “Theater of Dreams”, will explore the dreams of youth – adventure, friendship, love – through Broadway choral favorites and fun dance numbers taught by a fully-qualified staff in a safe, exciting environment. Camp Fees – $150 includes all music, 2 showcase tickets, and a nutritious snack each day. Roughly half of our campers are included by recommendation only, from foster care, Boys & Girls Club and Coalition for the Homeless and Camp Fees for these children are are waived. Sponsor a child today! For every $150 donated, one underprivileged child will be able to attend BOTH “Theater of Dreams” Summer Camp AND our Fall 2012 Children’s & Youth Arts season! Click here to make a donation and specify that you would like your donation earmarked to sponsor a child for our Children’s & Youth Arts program. Thank-you!! There will be a combined Showcase for family and friends on Saturday, July 21st at 7:00pm at Grace Covenant Presbyterian Church.